Black Brush (ブラックブラッシュ [black brush] in Japanese) forms the majority of the central Thanalan region. Its exact bounds have changed a little bit over the years, most notably the border between it and Spineless Basin (which used to be called Cactus Basin) to the south-east has creeped northward quite considerably. 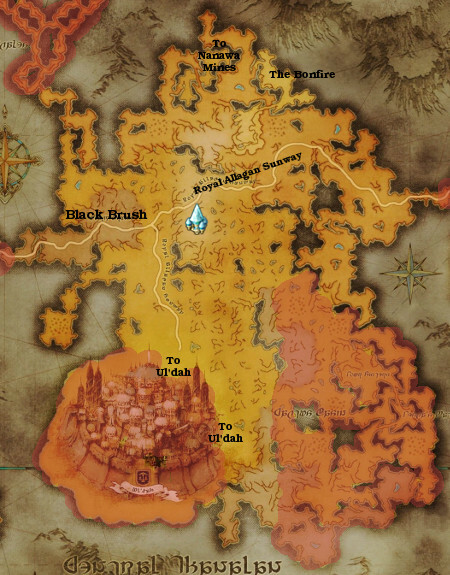 The gates to the city of Ul'dah used to give out directly to Black Brush in version 1.x, but since 2.0 they are found within the bounds of Spineless Basin instead. The local Aetheryte camp has stayed exactly where it is, at the crossing of the Royal Allagan Sunway and Starway, although these days it also functions as a railway station to the new cargo trains owned by Amajina & Sons Mineral Concern. Other traffic uses the Allagan ways, Sunway east through the Clutch to Drybone and west to Hammerlea, Horizon's Edge and finally the Rhotano Sea, while Starway leads north to Bluefog. The Soot Creek runs through Black Brush as its much-needed source of water. 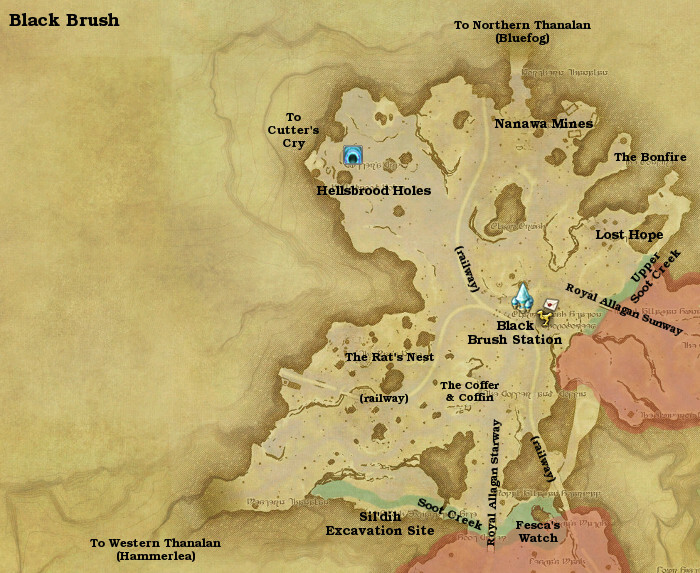 Being a central location in Thanalan right outside the city, Black Brush features a lot of habitation. Aside from the aetheryte camp slash railway station, the refugee settlement Lost Hope can be found to the north, a qiqirn encampment Rat's Net to the west, and an encampment for materia researchers known as the Bonfire. After the Calamity, the tavern Coffer & Coffin also relocated to the area. In the very northern tip are the Nanawa Mines. Since the Calamity, any traffic north to Bluefog must pass through the mines as the original road appears to have been destroyed. In place of the canyon that channeled the traffic in pre-Calamity times, there now stands an entrance to Cutter's Cry. The Black Brush Station (ブラックブラッシュ停留所 [black brush teiryuujo] or 'black brush station' in Japanese) started its life as an aetheryte camp that offered its meager shelter for travelers. Its ideal location at the crossroads of the Royal Allagan Starway and Sunway saw many refugees drawn to it, safe from the strict laws of Ul'dah for anyone who could not pay their keep. After the Calamity, refugees seem to have moved out, as the outpost is now characterized by a waystation for the newly built railway. The Bonfire (狼煙の丘 [noroshi no oka] or 'smoke signal hill' in Japanese) is the encampment of the goblin alchemist Mutamix Bubblypots and his crew. He set up in the area in the year leading up to the Calamity due to strict anti-beastman laws within the city, and never left - quite the contrary, the encampment has grown and taken root. Hellsbrood Holes (ヘルズブルード洞穴 [hellsbrood douketsu] or 'hellsbrood caves' in Japanese) is a dry and arid corner of Black Brush where many antlions make their nests. Since the Calamity, the area now features an entrance to Cutter's Cry which was previously only accessible from Bluefog. It is unknown whether this is meant to be a geographical shift or a retcon. Lost Hope (ロストホープ流民街 [lost hope rumingai] or 'lost hope refugee town' in Japanese) is a small village in a cave complex through which the Upper Soot Creek flows. It was established after the Calamity by refugees who had quite literally lost all hope of a better life. Many grow somnus flowers in the shelter of the caves, a flower that is well known to be the main ingredient of the forbidden somnus drug. The Rat's Nest (ネズミの巣 [nezumi no su] or 'rat's nest' in Japanese) is a qiqirn encampment on the west side of Black Brush. The qiqirn living here are largely bandits, and seem to be lead by Kokoroon Quickfingers. A loading station for the railway is located right to the south-west of the camp. The two Allagan-era highways, the Royal Allagan Sunway (アラグ陽道 [allag youdou] or 'allag sunlight road' in Japanese) and the Royal Allagan Starway (アラグ星道 [allag seidou] or 'allag star road') intersect in the middle of Black Brush. The Sunway crosses the southern parts of Aldenard in an east-west direction, and the Starway crosses the continent in a north-south direction. A deep gorge in the ground rent open by the Calamity through which the Soot Creek flows. The newly exposed area is connected to the ancient Sil'dih aqueducts below the city of Ul'dah, and soon became known as the Sil'dih Excavation Site (シラディハ遺跡 [siladih iseki] or 'siladih ruins' in Japanese). Note that the details of the Coffer & Coffin area is listed on its own page despite being officially part of the Black Brush area.